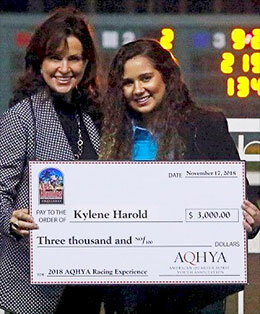 AQHA Chief Racing Officer Janet VanBebber presents top prize winner Kylene Harold with a $3,000 check. 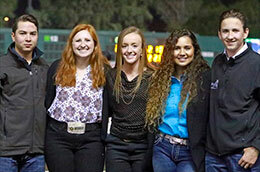 AMERICAN QUARTER HORSE ASSOCIATION—NOVEMBER 19, 2018—Five youth competed to earn scholarships worth a total of $6,000 November 15-18 at Los Alamitos Race Course in Cypress, California, during the Bank of America Challenge Championships. Five youth competed to earn scholarships worth a total of $6,000 November 15-18 at Los Alamitos Race Course. Three scholarships were presented to the high-scoring students who completed an application, online Racing Skillathon, including an essay question and an onsite interview during the Bank of America Racing Challenge Championships at Los Alamitos Race Course in California. The winners are determined from the cumulative score of the application, skillathon and interview. Kylene Harold won the top prize of $3,000. Finishing second was Emma Lowden, earning $2,000, and Allen Copeland was third, earning $1,000. The AQHYA National Youth Racing Experience introduces youth to the sport of American Quarter Horse racing. Participants got a behind-the-scenes look into the industry and met the people who help races go on every day, including stewards, announcers, owners, trainers, jockeys and their horses. Top AQHYA members were picked through a nomination and application process for this all-expenses-paid trip. For more information on the AQHYA National Youth Racing Experience visit, aqha.com/youth.